Want a perfect holiday gift for yourself? Think about a portable sauna! November 23, 2018 – Th is morning, as I was getting ready for work, I hopped into my infrared sauna with the current book I’m reading. I had a lot going on today and had to limit my time in the sauna to a twenty-minute session. But, if it’s at all possible, I make sure to use that sauna each morning! If you’ve often thought of owning a sauna, why not make this holiday season the time you decide to invest in your health and wellness and gift yourself with a Finnleo traditional or infrared sauna? Not a lot of people realize that there is a great selection of saunas that require nothing from you for set up—nothing! As long as you provide a level space to sit your sauna and a standard household outlet, you’re set. We will deliver your new sauna, set it up, plug it in and you’ll be hot and toasty that very day. Presently, we have eight saunas you can get delivered and will be ready to use the same day! 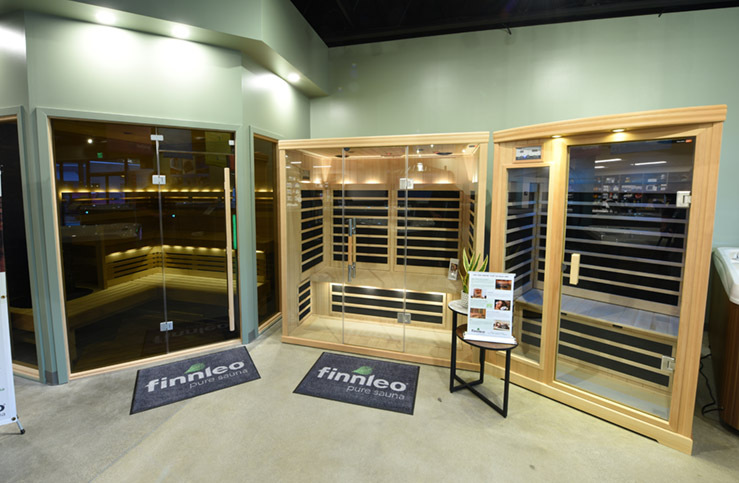 Finnleo is the premier sauna brand to lay claim to easy-to-install saunas. Six of the models we have available are infrared units, like the one I own. They all feature patented CarbonFlex panels to heat the room, which are the safest infrared panels available. No worries regarding electromagnetic radiation that’s unsafe like in other infrared rooms. Ours exceed Swedish standards, which are the most stringent safety standards out there! We also have a wonderful traditional sauna available, which is part of Finnleo’s Hallmark Series. You’ll enjoy a steam heat sauna session every day and be thrilled with how it makes you feel and appreciate its health benefits. And, if you want a unit that combines the best of both the traditional steam and infrared sauna worlds, guess what? Finnleo is the only sauna manufacturer to get UL listing for a sauna with both options in one room! The IS44 is the answer for you if you want a room where you can choose between infrared or traditional steam. These are outstanding units for your home: bonus room, master bedroom, master bath, workout room. AND—if you’re an apartment or condo dweller, rejoice! These are portable and easy to enjoy in smaller spaces. I use mine in my apartment in Seattle every morning. You’ll get plenty of opportunity to treat others to gifts this holiday season. Remember to treat yourself too! And, do it with something that will give back to you every day and boost your health and wellness. If you’re in our area, I hope you’ll stop by one of our six showrooms and take a look at the dream sauna you’ve always wanted. You won’t be disappointed!